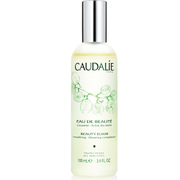 The perfect gift for a friend, table decoration for a party or pre-Christmas treat for yourself, this Caudalie Christmas Cracker contains some of Caudalie's best-selling hydration essentials in a handy travel size. Infused with soothing chamomile and moisturising grape water, this secret French formula works to trap impurities in the skin, sweeping them away in one simple step and leaving skin feeling clean, soothed and ready for the next steps of your routine. This sensitive skin saviour has an immediate and long-lasting calming and soothing action. It reactivates the skin’s hydration mechanisms and restores its water reserves. As skin becomes stronger, it feels softer and more comfortable. Micellar Water: Soak a cotton pad with four pumps of Micellar Water. Gently sweep the cotton pad over your face, eyes and neck. Repeat this step if necessary. Vinotherapist’s advice: To effectively remove all traces of eye makeup, leave the cotton pad in place for a few seconds, then sweep it gently downwards and around to the outside of the eye. Micellar Water: Aqua/Water/Eau, Glycerin*, Poloxamer 188, Vitis Vinifera (Grape) Fruit Water*, Heptyl Glucoside*, Capryl/Capramidopropyl Betaine, Sodium Levulinate*, Sodium Anisate*, Sodium Chloride, Parfum (Fragrance), Chamomilla Recutita (Matricaria) Flower Extract*, Citric Acid*, Vitis Vinifera (Grape) Juice*, Sodium Benzoate, Potassium Sorbate (067/178). I am 35. It is the first time I use micellar water and I like it. It cleanses really well. At the time, I do not use makeup. I use it am and pm using a cotton pad. Smell is ok, not a fan. I found the serum sticky. The sorbet is ok did not like the texture.